La Mitad del Mundo is a government owned park that is said to be the Equatorial Monument. The 30 meter tall monument commemorates the first Geodesic mission that calculated the world’s equatorial line. 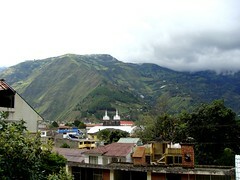 The place also has a small museum about the ethnic cultures of Ecuador. If you take the elevator to the top of the enormous monument you will have great views of the surrounding countryside. On weekends, locals hang out in the Middle of the World, which comes alive with folk music and dance show. Mitad del Mundo features a thick yellow line cutting through it like a highway partition, slicing the world into the north and the south. Entry time: Open daily 9am – 6pm.